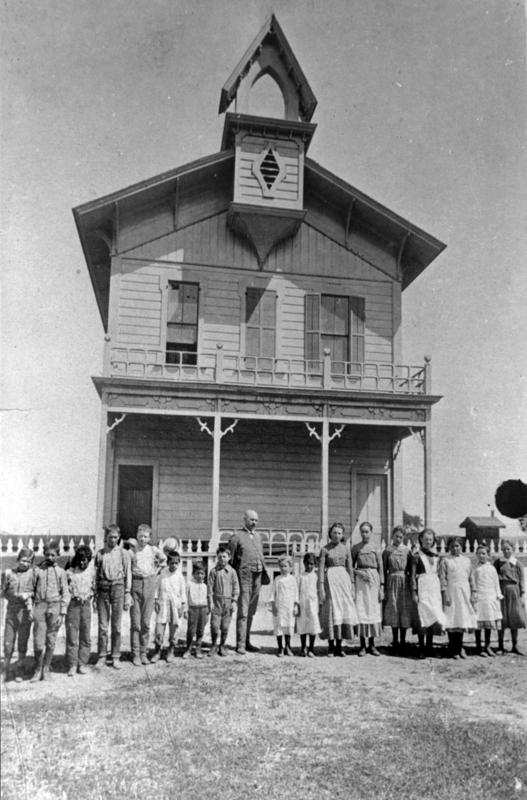 The first official Newhall schoolhouse was built in 1879 at the northeast corner of Walnut and Ninth Streets, two blocks back from Newhall's "Main Street," aka Railroad Avenue (not to be confused with today's Main Street, which used to be called Spruce Street). The school housed first-through-eighth graders and saw an average daily attendance of just seven children. No more than 13 ever attended on a single day, even though 53 school-age children were living in the vicinity when the school was erected. Pictured in the middle of this (ca. 1883) photograph is the teacher and principal, John Ellsworth Wright. According to Wright's great-grandson Sven E. Svenson of Oregon (pers. comm. July 2001), Wright was principal and teacher with the Newhall School District for nine years, later serving as principal of Miramonte School in the San Francisco Bay Area from 1908-1936. Wright had (at least) two daughters; Ethel Wright (Svensen's grandmother) was born in Newhall in 1897. This school building burned to the ground in 1890 and was rebuilt nearby. For more information read History of Newhall School. AP0113: 9600dpi jpeg from copy print.